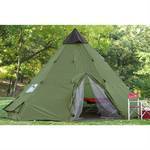 18'x18' TeePee Tent, polyester shell, waterproof, covered mesh windows, polyethylene floor, file photo, not fully inspected, looks used. Oversized Club Camp Chair, 500lb capacity, foldable steel frame, 600 denier polyester with polyurethane coating, storage bag, inspected, like new. Biddeford Microplush Electric Blanket, dial heat controllers, auto shut off, machine washable, not fully inspected. Ameristep Director Chair, padded armrests and backrest, matte finish, heavy duty, weatherproof, zippered gear pouch, inspected, like new. Swivel Hunting Chair, oversized padded seat, padded back rest, folding legs and carry strap, tubular steel frame, 300 denier fabric, inspected, like new. Guide Gear Big Boy Comfort Swivel Hunting Blind Chair with Armrests, swivels, steel frame, 500lb weight capacity, Dura Mesh fabric seat, inspected, new. 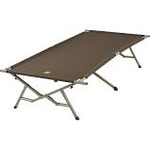 Slumberjack Big Cot, steel frame, 600 denier polyester fabric, tension grip end bar, carry bag, 86x40x20”h, inspected, new. Guide Gear Rectangular Sleeping Bag, 20 degree rating, inspected, looks new. Aluminum Deer Cart, 15" solid-rubber spoked wheels, balanced design centers the weight, 250lb weight capacity, folds flat for storage, inspected, new. 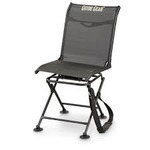 Guide Gear Oversized Tall Director's Chair, 500lb capacity, steel frame, 600 denier polyester fabric, padded foam armrests, side table and cup holder, 22" seat height, inspected, scratches on side table, like new. ALPS OutdoorZ Commander X + Pack, 1,680D nylon ballistic/Robic nylon, pack bag attaches to frame with zippers, rifle/bow drop-down pocket, hydration compatible, rain cover and LED light, 9 lbs- 3 oz, inspected, like new. 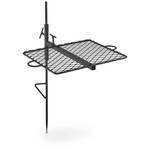 American Hunter 5-gallon Digital Hanging Bucket Feeder, used. 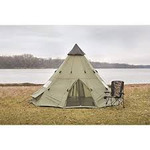 Waterfowl Layout Hunting Blind, 600 denier polyester shell, water resistant coating, mesh covered dual doors, steel frame, mud proof bottom, zippered flag port, lumbar supported, 82"long, inspected, looks new. 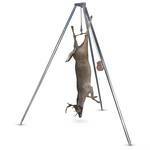 Tripod Portable Game Hanger, 500lb weight capacity, manual crank with cable, 9' high, file photo, inspected, new. 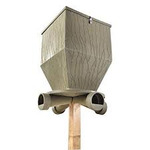 Waterfowl Layout Hunting Blind, 600 denier polyester shell, water resistant coating, mesh covered dual doors, steel frame, mud proof bottom, zippered flag port, lumbar supported, 82"long, inspected, used. Lot of 3 US Military Ammo Cases, PA154 120mm and PA156 81mm. 14'x14' TeePee Tent, polyester shell, waterproof, covered mesh windows, polyethylene floor, file photo, looks new, not fully inspected. 14'x14' TeePee Tent, polyester shell, waterproof, covered mesh windows, polyethylene floor, file photo, looks used, not fully inspected. 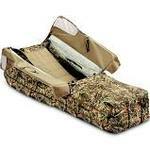 Waterfowl Layout Hunting Blind, 600 denier polyester shell, water resistant coating, mesh covered dual doors, steel frame, mud proof bottom, zippered flag port, lumbar supported, 82"long, inspected, new. 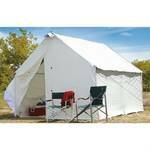 18'x18' TeePee Tent, polyester shell, waterproof, covered mesh windows, polyethylene floor, file photo, looks used, not fully inspected. Oversized Zero Gravity Lounger Chair, powder coated steel frame, 600 denier polyester fabric, 22" seat, lever locks, integrated pillows, molded comfort armrests, inspected, new. 600lb Oversized Directors Chair, steel tube frame, polyester fabric, side table with built in cup holder, folds flat, inspected, light damage from shipping. Guide Gear Oversized 500 lb. Zero Gravity Chair, steel tube construction, headrest pillow, folds for storage, inspected, new. G. Loomis NRX Blue Jig & Worm NRX 803C JWR Casting Rod, medium-heavy, extra fast action, 6'-8'', split cork grip, 12-16 lb line rating, 3/16-5/8 oz lure rating, NRX Graphite blank, Fuji Titanium SIC stripper guides, RECOIL black coated guides, skeletonized reel seat, inspected, new. Campfire Swing Grill, 24" x 18"surface, 3'6" support post, height adjustable from 8"-25", canvas carry bag, inspected, new. 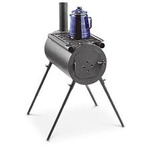 HQ ISSUE Camp Stove, steel construction, front and rear airflow vents, removable legs, dual side cooking tubes, fold flat carry handle, 4 interlocking pipe sections, inspected, new. 500lb Oversized King Camp Chair, steel tube frame, padding on neck and shoulders, built in cup holders, hanging storage pouch, folds flat, storage bag, inspected, new. 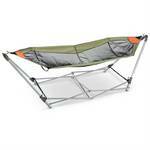 Portable Folding Hammock, foldable, steel frame, 8' long, mesh fabric bottom, carry bag with backpack style shoulder straps, 22 lbs, looks new.